My Manufacturing Trend Watch column -- Innovation thrives in digital workspaces -- on Manufacturing Pulse is out, with an answer to bans on telecommuting starting with Yahoo. I'm all in favor of face-to-face meetings. I don't think they always need to happen every day for innovation to grow. With Facebook moving us to daily chats with distant friends (and games), the manufacturing world is growing its own connections in the so-called Cloud. As I wrote in the article, I keep getting stuck in the Local-Motors website browsing the open-source design projects uploaded by members, and the discussions that create little circles of advisors and collaborators. 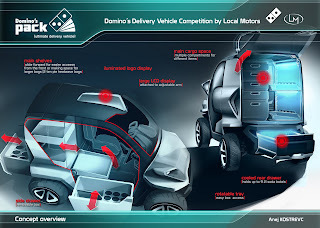 There's even an offshoot being developed by DARPA, GE, and other partners. 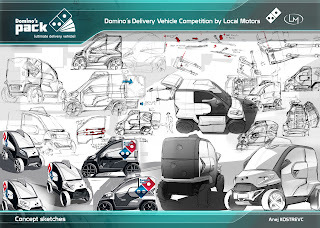 The new Domino's Pack project, winner of the challenge to create the ultimate delivery vehicle, is currently claiming my attention. There are lots of ways companies can use the cloud. I commented on that a while ago in Choosing online collaboration tools for teams. Posted in 2010, it's bound to be out of date, but the idea is the same.